This week I've had breast cancer, pancreatic cancer and skin cancer. Or at least I've had it in my mind. That's because I'm a huge hypochondriac - a.k.a. a person who suffers with health anxiety. I know hypochondriacs are always depicted as goofy, over-the-top, compulsive types on sitcoms but being a hypochondriac is sometimes very debilitating and lonely. It can consume your every thought and make you completely miserable, and subsequently, affect the people around you. I think I've always been a bit over compulsive when it comes to sensations I feel in my body. While most people wouldn't even concern themselves or even notice these normal bodily fluctuations, I feel like mine are heightened, and each one has a huge sign pointing at it saying "I could be a terminal illness!" I started seeing a new doctor last year, and she's awesome! I really like her. 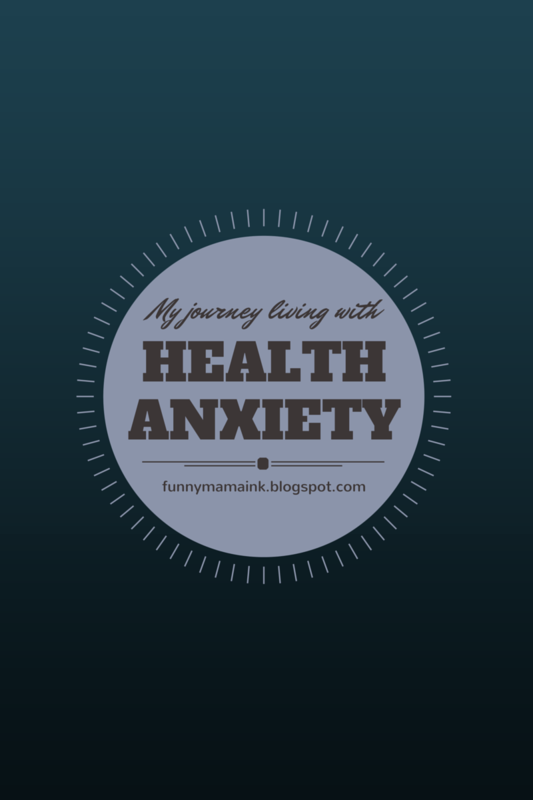 One of the first things I discussed with her was my health anxiety. She assured me that most of the funny little gurgles and twinges in our body are not usually reason for concern - it just means things are working the way they should. I've remembered that over the years, anytime I'm about to go over the edge with my worrying and over-analyzing. I'm also pretty sure that I could perform open-heart surgery if I had to, purely because I have read up on every single disease known to man. And I've probably thought I've had every one of those illnesses too. Google has both calmed and created some of my worse health fears. If you suffer from hypochondria, stay away from Dr. Google. He always gives you the worse case scenario. Every single time. The worse thing about anxiety is that it creates a vicious cycle. Because I have anxiety about symptoms I am feeling, my anxiety creates more scary symptoms like dizziness, shallow breathing, pain, etc. These are real sensations, so how do you know if they should be of concern? Are they real problems or just side effects of my scary anxiety monster? My anxiety got so bad a few years ago, I actually saw a therapist about it. I would spend every minute of the day on my smart phone looking up different diseases I thought I had. When you looked at the browser on my phone, I had dozens of windows open - all related to health issues. I knew I needed help because it was affecting my every day life. I was depressed, irritable and obsessed. The therapist helped so much - it was just common sense stuff but it just sunk in. She knew that I was a person of faith and said, if I truly believed that God had a plan for me, I would just live without fear knowing that there is a bigger plan for me. She also said that people get cancer all the time and live, so not everything that goes wrong is a death sentence. She gave me some other ideas to help distract me, and to alleviate some of my physical symptoms. It made a huge difference but... I've had a slight relapse as of late. It seems like every day I hear another story of some strong, young, healthy person getting cancer and dying within a few weeks. It just oozes into my brain and I can't shake it. I've heard two stories this week of people who had sore backs and all of a sudden, within a few weeks, they died of cancer. So when my back started hurting this week, I went to that dark, scary place in my mind. 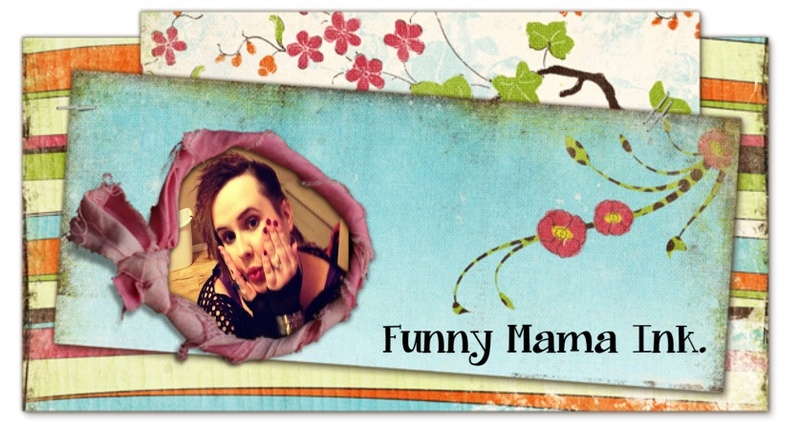 I was so worried about it I was actually in tears over it, and being super short with my kids. Even though part of me knows it's all in my head, the other part totally buys it. Having anxiety is like being trapped in your own mind, stuck with your own scary thoughts, and there is no way out. Your brain is like a prison. Anxiety IS a mental illness and should not to be taken lightly. It really can have a negative effect on your life if you let it consume your every thought, and if it stops you from living your life to the fullest. Will I be this way for the rest of my life? There's a pretty good chance. Do I have the tools to help get me out of those spirals of doom? I sure do. Will I die one day? Of course. 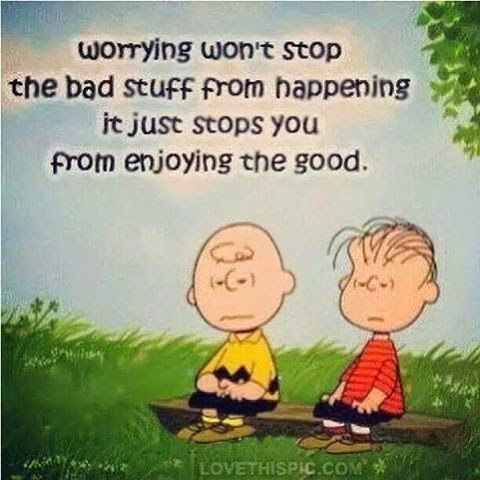 But as Linus said: "Worrying won't stop the bad stuff from happening, it just stops you from enjoying the good." Do any of you suffer from anxiety or a mental illness? It's much more common than we realize.